I went shopping last week. So depressing. Not only were the clothes not that attractive (I am being kind) but they were so immodest. The week before I was shopping with my tween granddaughter and ran into the same issues. No one wants to see either of us in what was out there, believe me! And it is not just me, all my friends complain that finding cute, modest clothing is IMPOSSIBLE! 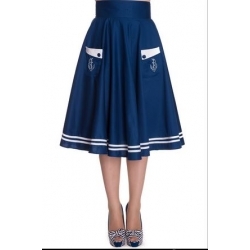 But look at this cute skirt! I love it! While in Orem, Utah Monday (long layover while traveling from Cali to Ohio) I found the BEST SHOP EVER! Don't let the store's name freak you out. Sister Missionary Mall isn't just for Sister Missionaries! Think about it. Clothes that 19 to twentysomething year old women would find attractive (therefore not matronly) and modest enough to wear to church! Yeah!!!!!! And the prices are great, especially when you check out their clearance section. They--have--dresses--gasp! When was the last time you were able to find a dress you could wear to work or church! And their blouses are the sweetest things ever! They even have a facebook page where they put pictures of the newest fashions to come in. Be sure and check them out soon, you won't be sorry! Modest clothing is definitely hard to find. I'm always on the hunt for cute skirts that are a comfortable length. I'll just have to take a moment and explore 'Sister Missionary Mall'.